Kelly Morrow is a core faculty member in the Department of Nutrition and Exercise Science at Bastyr University. She is a faculty supervisor and nutrition clinic coordinator at Bastyr Center for Natural Health and also sees patients in private practice at Bastyr Center. Kelly works from a functional medicine perspective and takes a detailed history from her patients in order to identify the genetic, environmental and lifestyle factors that influence health. (Learn more about functional medicine.) She enjoys the challenge of working with clients who have complex health issues. Kelly’s background includes both clinical and culinary experience. 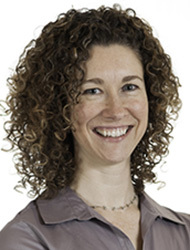 She has worked in private practice since 2000 and has been a clinical supervisor at the Bastyr Center since 2002. She was a clinical dietitian at the Evergreen Hospital Cancer Center, the Booth Gardner Parkinson’s Center and she has also worked in community health promotions. Kelly has completed a three-part intensive whole-foods cooking certificate program through the School of Natural Cookery and draws on this experience when helping clients modify recipes and create menu plans. In addition to being a clinical supervisor at Bastyr Center, Kelly gives lectures on nutrition-related topics to lay audiences, corporate groups and health care professionals and has been interviewed for radio and TV including KING/5 HealthLink, Evening Magazine, KOMO/4 News, Q13 News, and KIRO radio’s the Ron and Don Show with Rachel Belle. She is often quoted in magazines and newspapers, including the The Seattle Times, MSN Network, Alaska Airlines Magazine, Bastyr's Healthy & Wise, Northwest Prime Time and the PCC Sound Consumer.